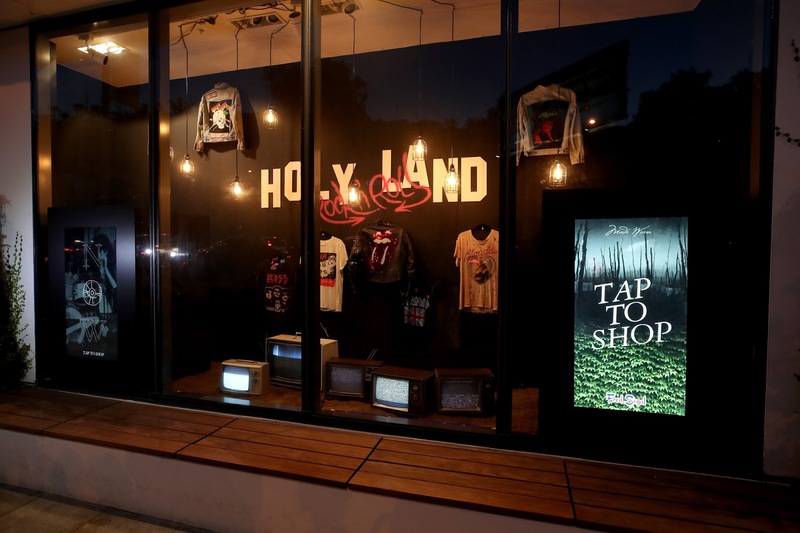 Fred Segal has opened an interactive environment at its Sunset Strip flagship in partnership with MadeWorn and Mastercard: "Rock 'n Roll Holy Land" offers exclusive merchandise and an innovative new way to shop. The experience features exclusive merchandise from MadeWorn, an LA-based creative brand that specializes in handmade products showcasing American craftsmanship. Merchandise from bands such as Kiss and Def Leppard will also be available for purchase. Customers can also view 300 custom vintage MadeWorn looks that are displayed to help them find inspiration for their Coachella and festival looks. Special appearances by artists, including Cypress Hill members, are scheduled to tie into the experience. The space has been decorated with a 50-foot tour bus, neon signs and photographs aiming to create an immersive environment. “For over 50 years Fred Segal has led the way in experiential retail and we are always looking for unexpected and unique elements that add to the shopping experience,” said John Frierson, president, Fred Segal in a release. Sherri Haymond, executive vice president for digital partnerships, Mastercard went on to explain that “Today, people want to step into a store and do more than just shop; they want it to be a destination that seamlessly blends the digital technology that is a core part of their day to day life with their physical environment." Indeed, digital is helping the experience operate outside of regular store hours in an innovative new way. When Fred Segal is closed, customers can still digitally select and purchase products from an interactive shoppable window. Purchases are then shipped direct to the customer. Mastercard has also partnered with Snapchat to release special Snapcodes that tie into unique retail events to cardholders . Rock 'n Roll Holy Land is located at Fred Segal's West Hollywood location at 8500 Sunset Boulevard. It is open now and runs through May 6th.